Although Canada has experienced increasing immigration pressures, including receiving in 2017 the highest number of asylum claims in its history, the country has not witnessed the same acrimonious public debate over immigration seen elsewhere. It has adopted important reforms, including the introduction of a National Immigration Detention Framework aimed at improving detention conditions and reducing the use of prisons for immigration reasons. 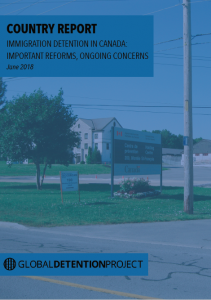 Concerns, however, remain: One third of immigration detainees are still held in prisons, including individuals with mental health conditions; there is no maximum limit to the length of detention; children may be “housed” in detention facilities to prevent the separation of families; Canada is one of only a handful of countries with a mandatory detention policy, which includes detention for up to 12 months with no judicial review; and anti-terrorism provisions in its immigration legislation have been used to detain and deport foreign nationals on secret evidence.